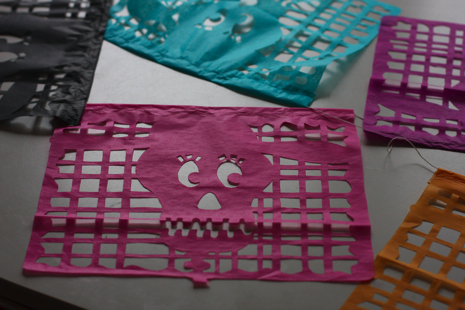 This is my first Day of the Dead paper cut banner, or “papel picado.” I LOVE paper cut art, so I had a great time cutting this design out of tissue paper with a craft knife. First, I drew the skeleton wearing a hat on a regular 8 1/2″ by 11″ piece of white paper. Then I used one of my quilting rulers to create a background grid design. Next, I photocopied my design and used clothespins to secure the copy to a stack of five different colors of tissue paper. Then I used a craft knife to cut away all the negative space in the design. The last step is to glue the tissue paper flags to a length of string. The paper is so thin that a glue stick or bit of white school glue will do the trick. I can upload my design as a pdf if anyone wants to use it. Otherwise, check out the clip of today’s TV craft segment to see how you can make a design using a template. My first foray into sugar skull-making, was a bit of a mess, but I had fun. 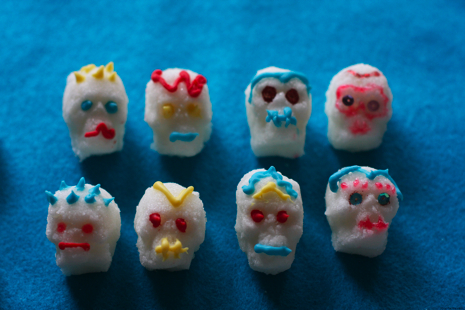 I made these skulls using small plastic candy molds. You can buy official sugar skull molds, but I decided to keep it simple and use whatever I could find during a recent trip to my local craft supply store. To make the skulls, mix up 1 cup of sugar with 1 teaspoon of meringue powder. Add just enough water to make the mixture the same consistency as sand. Scoop the mixture into to the skull mold. Flip the skulls out onto a cookie sheet or piece of cardboard and let dry overnight. Decorate with colorful frosting if you want to eat them. If you don’t care to eat them, you can go all out with the decorating and using glitter glue, beads, sequins and whatever else you can think of. These crafts were inspired by a Day of the Dead Mini Print Exhibit I previewed in my last art & craft column. Researching this tradition of celebrating the lives of lost loved ones inspired me to crack open a book of projects I’ve been inching to try. 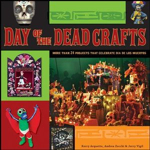 “Day of the Dead Crafts: More than 24 projects that celebrate Dia de los Muertos” by Kerry Arquette, Andrea Zocchi and Jerry Vigil is a great primer for crafters looking to take a handmade approach to Day of the Dead festivities. It includes templates for banners and other projects, so you don’t have to draw your own skeletons if you don’t want to. P.S. If you’re local, check out the ‘Day of the Dead Mini-Print’ exhibit tomorrow night in Grand Rapids (Oct. 31). I took my daughters this evening and really enjoyed it. I have my eye on a print that I hope to add to my small print collection. The exhibit features artists of varying experience levels commenting on death in a most entertaining way. From skeletons playing “telephone” to prints of steaks and other dead meat, this exhibit of 3×3-inch prints is as thought provoking as it is entertaining. The exhibit is open from 5 to 10 p.m. Saturday at Red Hydrant Press Studio, 314 Straight Ave. SW (Door M). You should go. Seriously. Spot on with this write-up, I actually suppose this web site wants much more consideration. I’ll probably be again to read much more, thanks for that info. Hello! I know this is kinda off topic but I was wondering which blog platform are you using for this website? I’m getting sick and tired of WordPress because I’ve had problems with hackers and I’m looking at options for another platform. I would be awesome if you could point me in the direction of a good platform.